The Common Earwig, also known as the European Earwig is a rather peculiar looking bug with a pair of impressive claws. The name comes from a common superstitious belief that the creature can crawl in a human’s ear and pierce the eardrum with the claws. When in danger, the Earwig may indeed seek shelter in an ear, but the rest of the story is just drivel. 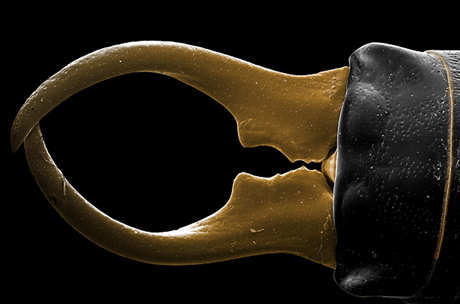 The bug itself is rather small, reaching only 13 mm in length, but many rumors have been circling around this creature, because the reason why such a small bug has such impressive claws has always interested humans. Common Earwigs are widespread all round the world, except the polar territories and they have different lifestyles depending on the territory inhabited – some tropical populations even live as parasites on the bodies of rodents or bats, being attached to their fur. Short legs and a flattened, smooth body indicates that this animal prefers a secluded lifestyle. They spend most of their time hiding in the smallest gaps and holes, as close to a wall as possible. At dusk or night, the Earwig goes looking for food. Although the male Earwigs have quite large wings, they are usually not used and unlike other winged bugs, Earwig prefers walking. 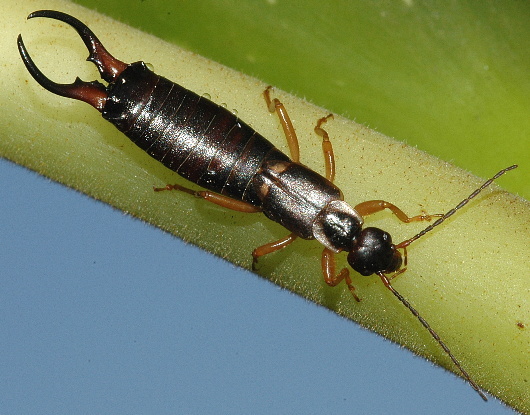 Common Earwigs are omnivores, which means they’ll eat anything they come across. Most often their diet consists of leftovers, fallen fruit and carrion. They also often climb trees to find sweet fruits or flowers. They can be a menace to farmers, because large Earwig populations can destroy any fruit orchards. Interestingly, the massive claws are not used while feeding. Instead, their purpose is rather limited – they’re used to scare the enemy when in danger. If compromised, the Earwig raises the claws just like scorpions raise their tail when preparing for a sting. The mating period of Earwigs usually occurs in fall, before the females find a place to spend the winter. After copulation, the pair finds a warm place for the winter and early in spring, the female lays 20-50 eggs. Earwigs are unique in the amount of care for their descendants – the parents guard the eggs and constantly lick them to keep them safe from bacteria and diseases. Five to six weeks later, caterpillars hatch. They look like a white miniature of their parents. The mother feeds and tends after the young Earwigs for 10 days, when they drop their skin for the first time. Caterpillars go through four phases before they become mature, and although they start hunting already after the first change of the skin, they usually stay with their parents up until the fall. Such a caring behaviour towards the young is unique only to Earwigs, among all bugs.